What the intersection looks like without cars. Ride the Drive 2016. The John Nolen Drive/Blair Street corridor is arguable the most important bike corridor in Madison. Several thousand people ride their bikes on some part of it daily. And as it is, it has several problem spots, most prominently the intersection at Machinery Row and the crossing of John Nolen Drive at North Shore. Fixes to these and other problems in the corridors have been discussed for a long time. But now we're getting closer to actual decisions being made, and we need to make sure that the needs of people walking and biking will be adequately addressed. Next Wednesday, 7pm at Monona Terrace there will be a public involvement meeting, and I encourage all of you to attend. This concept has much merit. But of course it is going to be complex and costly, with currently no budget or timeline when we might see it come to fruition. We need to also ask for improvements now. 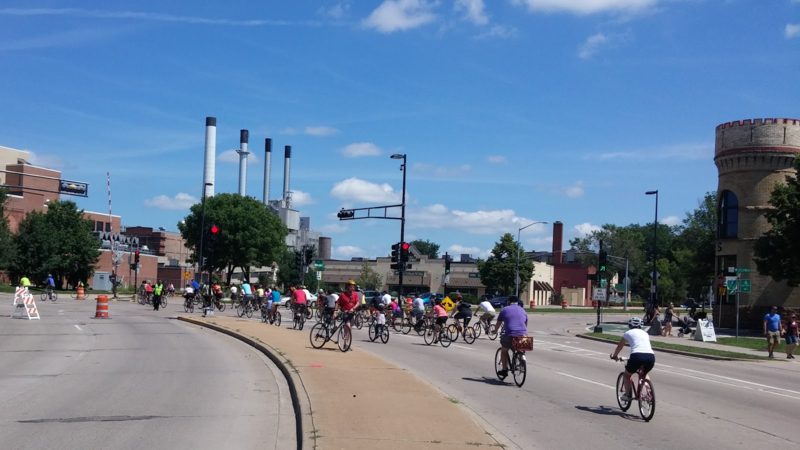 For the Willy/Blair/John Nolen intersection at Machinery Row, all focus lies on the movement of people between the Cap City/Willy/Jenny St corridor and the Cap City Trail along Lake Monona. This is important, but what about people who ride on the Cap City Trail and want to continue toward the area around the Capitol and vice versa? What about people who want to walk from Machinery Row to Essen Haus? 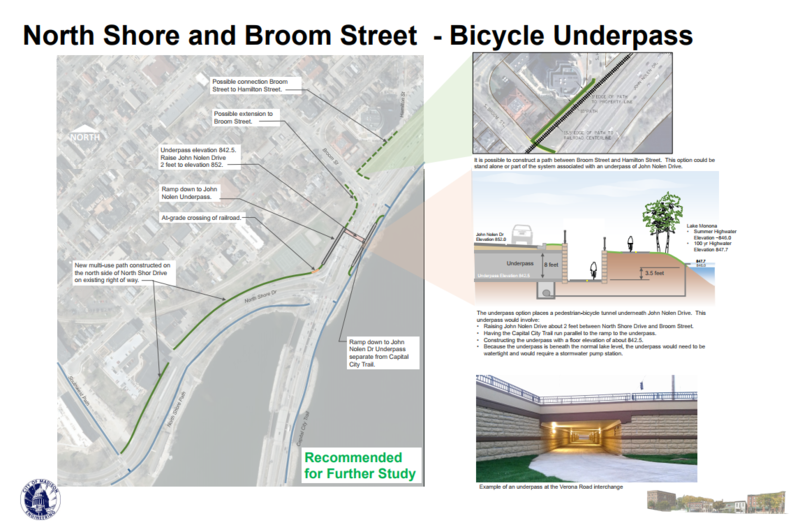 It appears that the idea there is that everybody would use the proposed overpass between Law Park and Wilson Street. Again, the overpass will only be built many years from now, and depending on where you want to go, this would be a significant detour requiring additional crossings. Again, we need improvements now. For a city that says in all its planning documents that it is committed to increase the proportion of people biking and walking, we need to do better. I encourage everyone to attend the meeting in person and/or submit your written comments to city engineering and Strand Associates. Public input can make a difference: For instance, I have learned that one of the alternatives suggested for further study at the previous meeting, a couplet of one-way streets using Blair and Blount Streets to make it even easier for people in cars, was scrapped because citizens like you vocally opposed it. Background material from previous meetings can be found on http://www.cityofmadison.com/engineering/projects/blair-st-john-nolen-dr-corridor-study I especially recommend looking at the materials from the April 17 meeting, including the "Exhibit..." documents.